You can purchase the 38-page unit for MASTERPIECE by Elise Broach NOW for immediate download for only $18.95! 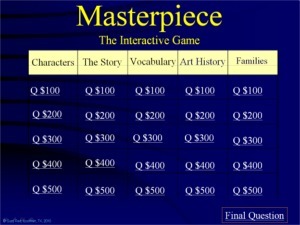 Includes a PowerPoint Jeopardy-type game. Marvin is one of a family of little black beetles that live under Mr. and Mrs. Pompaday's kitchen sink. He watches the Pompadays carefully and has learned how to secretly, and safely, pilfer food that has fallen from the baby's high chair. He takes a particular interest in 11-year-old James who is Mrs. Pompaday's son by an earlier marriage. James is different, not boisterous and rude, but compassionate, gentle, and for the most part, ... ignored. When James receives a pen-and-ink set for his birthday and inadvertently leaves the ink bottle open on his desk, Marvin dips his leg into the ink in the cap and creates a tiny, exqusite, unique drawing that, strangely enough, resembles the work of the great Reniassance artist, Albrecht Dürer. James gets all the credit for the masterpiece. From there, the unlikely friends begin an adventure that takes them into a fast-paced mystery involving some stolen masterpieces, centered in the Metropolitan Museum of Art. The story will bring art treasures to life for students, introducing the works of some of the most famous artists in history. Gregor the Overlander by Suzanne Collins --One of the GREAT adventures ever! 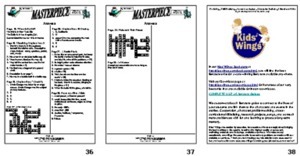 You can purchase the 38-page unit for MASTERPIECE by Elise Broach NOW for immediate download for only $18.95! 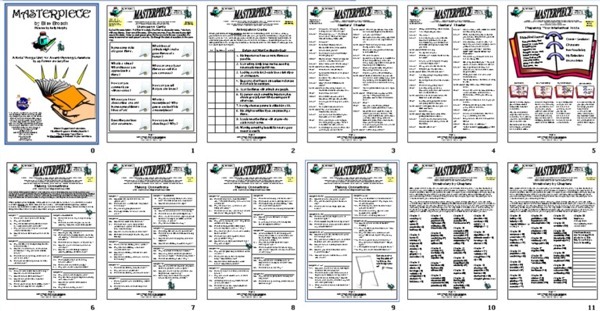 Includes a 53-slide PowerPoint Jeopardy-type game. 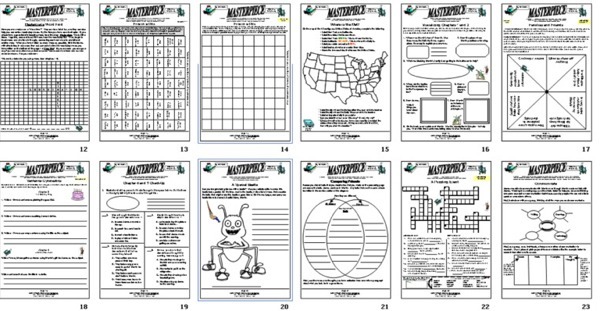 MASTERPIECE is included in the Kids Wings Tempests and Teamwork Collection of literature guides for award-winning novels and intermediate-level picture books. 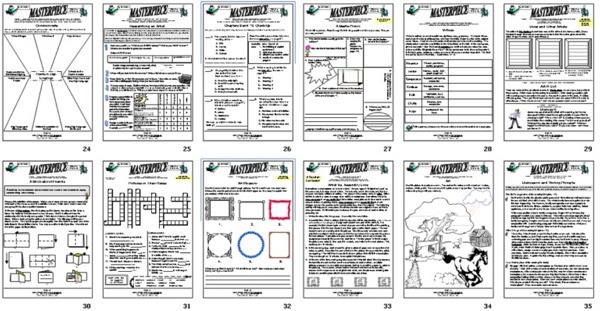 Our Tempests and Teamwork package includes a site license for one school, a spiral bound book, and CD containing 29 titles with over 700 pages of activities, nine "Jeopardy-type" games, Karoke-type songs, and professionally recorded songs! 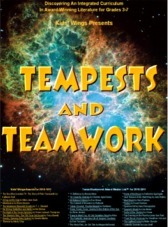 You can purchase a literature guide individually for around $20.00, but if you order Tempests and Teamwork, you can get 29 literature guides for only $25, or less than $1 each! This is probably the greatest bargain in the USA, as long as quantities last! Buy MASTERPIECE by Elise Broach NOW!